Amazon Smile: By shopping at AmazonSmile, Amazon will donate .05% of the price of your eligible AmazonSmile purchases to Hillel JUC. Even if you have an Amazon Prime account, simply sign onto smile.amazon.com with your current Amazon or Amazon Prime username and password, and designate Hillel Jewish University Center as your charitable organization of choice. Then start shopping! Chankuah? Birthday? Bar or Bat Mitzvah? Want to send a Gift Card? What a great way to support Hillel JUC! 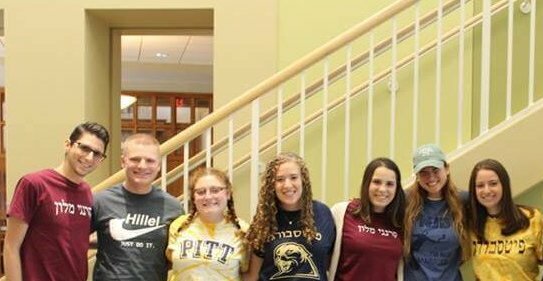 CMU-Hillel Fund: Giving a gift specifically to CMU-Hillel supports Jewish life on the campus of Carnegie Mellon University. Your donation to the CMU-Hillel Fund counts as both a donation to Hillel JUC and as a donation to CMU, making you eligible for the giving circles and societies oﬀered as being a part of the CMU giving community. Gifts of Securities: Making a gift of appreciated securities (stocks, bonds or mutual funds) to Hillel JUC is easy and has special tax benefits for the donor. Please note that the instruction letter to your broker should clearly indicate that proceeds from the sale of securities should be designated to support the Hillel Jewish University Center. For more information, contact Jennifer Poller, Development Director. Matching Gifts: Want to double the impact of your gift? Many companies sponsor matching gift programs that will match contributions made to Hillel JUC by their employees or their employees’ spouses. Online: Give monthly through a monthly pledge automatically charged to your credit or debit card or an annual gift and you’ll enrich the lives of Jewish college students. Please use the donation form below! Tribute Giving: Honor a friend or family member or send a condolence to someone in memory of their loved one. Simply send a check or submit an online donation, let us know the reason for the gift, the note you would like to include, and where we should send the Tribute Card. We will send the card on your behalf to the recipient.